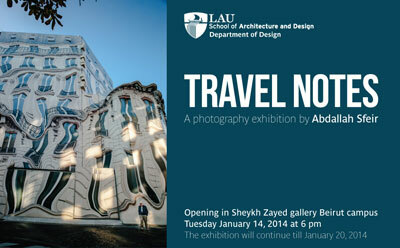 Faculty member Dr. Abdallah Sfeir’s photography exhibition entitled “Travel Notes” opens on Tuesday, January 14, at 6 pm in Sheikh Zayed Hall. The exhibition will be open every day 7 pm, and will run up until Monday, January 20. All are invited to attend the opening, and to see the exhibition.